PanARMENIAN.Net - Parishioners in Syria's Aleppo are actively returning to the restored Forty Martyrs Armenian Cathedral, which was destroyed by militants of the Islamic State militant group in 2015, RIA Novosti reports. "We are very pleased to be able to return and come here again, we hadn’t been here for a long time because of the war, one of the parishioners said. "The church is also a place where people meet. All our brothers, engineers, doctors, workers can now come here. This is great happiness." 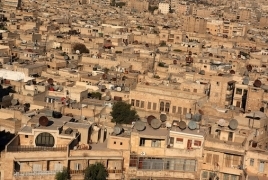 The Armenian Diaspora in Aleppo can be traced back some 2,000 years and tens of thousands remained in the city up until the outbreak of the civil war in 2011.